Includes many common useful features such as searching youtube and setting reminders, so that you don't need a seperate bot for each~! 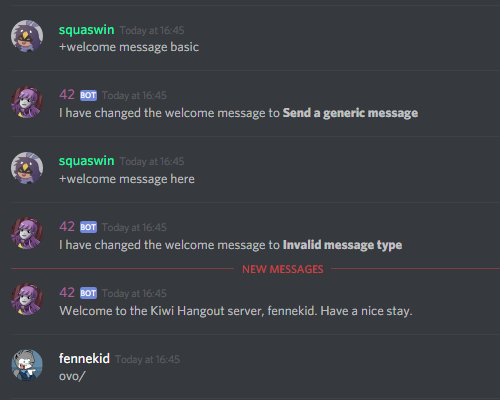 Also some less common features such as setting your AFK message, or creating a repeating announcement message and timetravelling through chat. No permissions to set up if you don't want to. Roles and permissions are used to determine which commands are available. 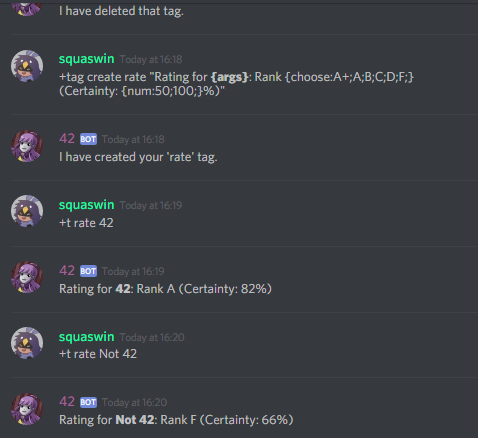 However, if you do want more control over who can use 42, you can use toggle to disable commands, and assign special bot mods and admins. 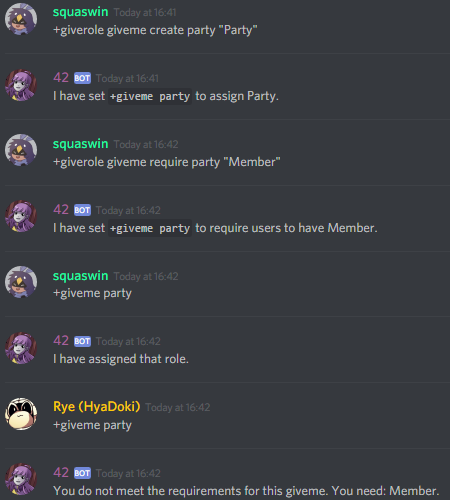 With the tools given, you can create roles that can require prerequisite roles, ensure its not given to people with different ignore roles or only work for members who have been on the server long enough. 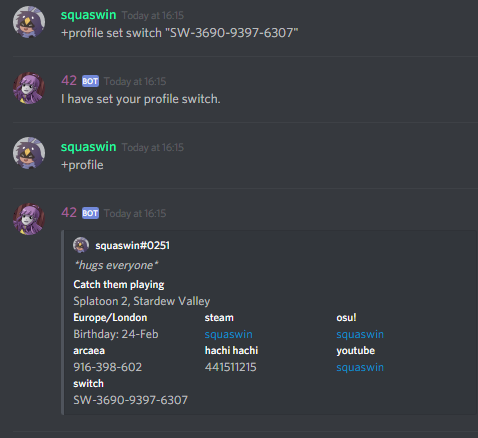 This lets you create a private or public channel to track all kinds of events, such as when people join or leave, when channels are created or even when messages are deleted. 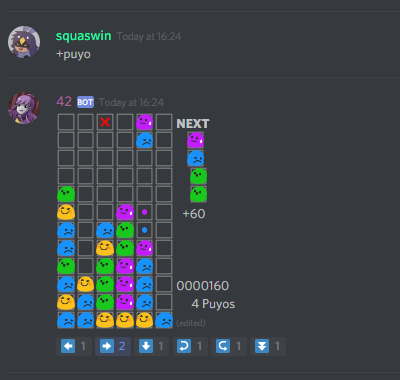 Its like Discord's audit log, but its on sterroids! The powerful tag system can be used to help keep track of your notes, videos, pictures, out of context screenshots and lolcats. It also includes a extremely powerful pseudo-scripting language to allow you to create dynamic tags. Customise the message, set a destination, even wait until the new user starts talking. 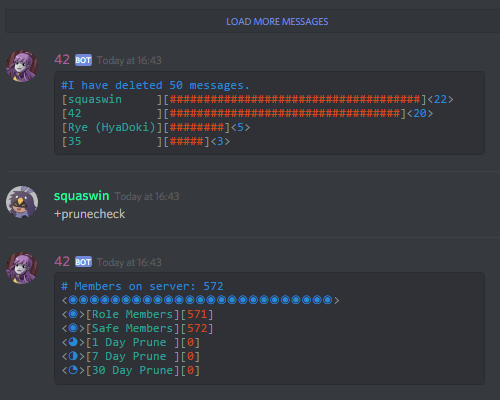 Delete large chunks of chatlog or find out how many people would be kicked in a prune. Play slots, video poker or blackjack in an interractive casino window with reaction controls. 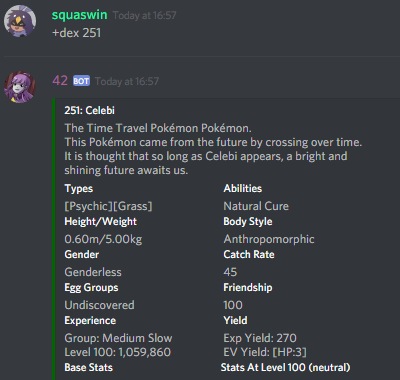 Check the Splatoon 2 schedule, get something from a Pokédex, or even just picking a random Smash character. Alternatively, you can click the top left of the page or use the join command. 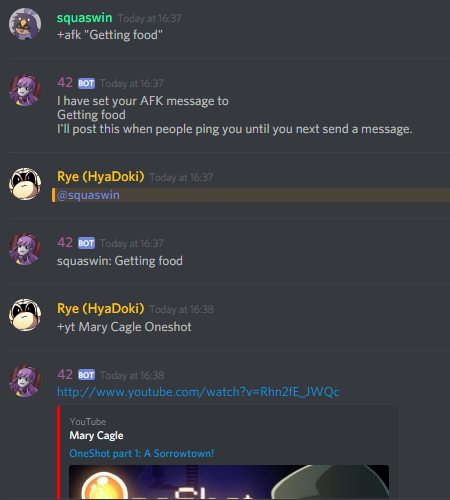 You'll need Manage Server to invite bots. 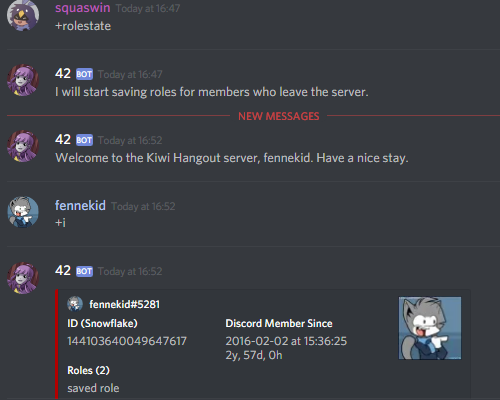 Join Kiwi Hangout and we will be happy to help answer any questions you may have. Kiwi Blitz is a webcomic by Mary Cagle. 42 is character from that very webcomic. Check it out if you get the chance. It's rather good.